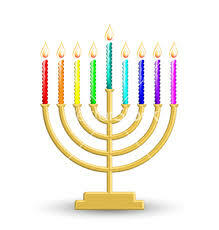 Tonight Hanukkah begins at sundown. I know I’ll be busy eating latkes until I explode. Although not a major holiday in the Jewish calender, now is as good a time as any to shed some light on the LGBTQ Jewish community. In the award winning documentary film Trembling Before G_D film maker,Sandi Simcha DuBowski highlights the struggle some LGBTQ members of the Jewish faith must overcome. It you haven’t seen this movie, tonight’s a great night to check it out. The film is at times a hard watch but coupled with hope. If your interested in learning more about LGBTQ Jewish organizations, check out the Keshet organization and Nehirim community pages.